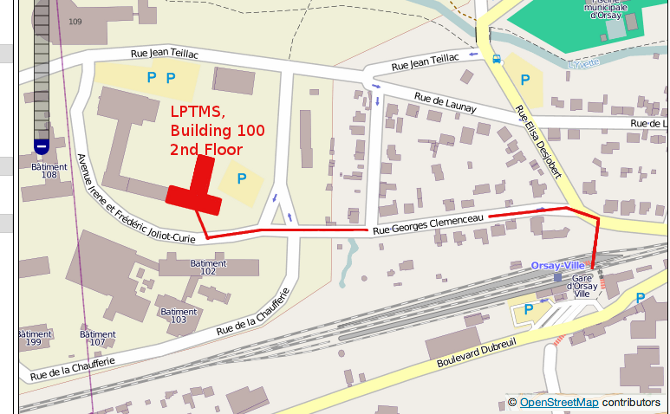 LPTMS is situated on the Orsay campus of the Université Paris-Sud, approximately 25 km south-west of Paris. 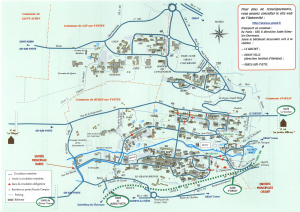 The campus is accessible from Paris via the RER B. Get off of the RER B at the Orsay-Ville station which is approximately 35 minutes from the Châtelet-Les Halles station in the center of Paris. Paris : Take the RER B in the direction of Saint-Rémy-lès-Chevreuse getting off at the Orsay-Ville station. 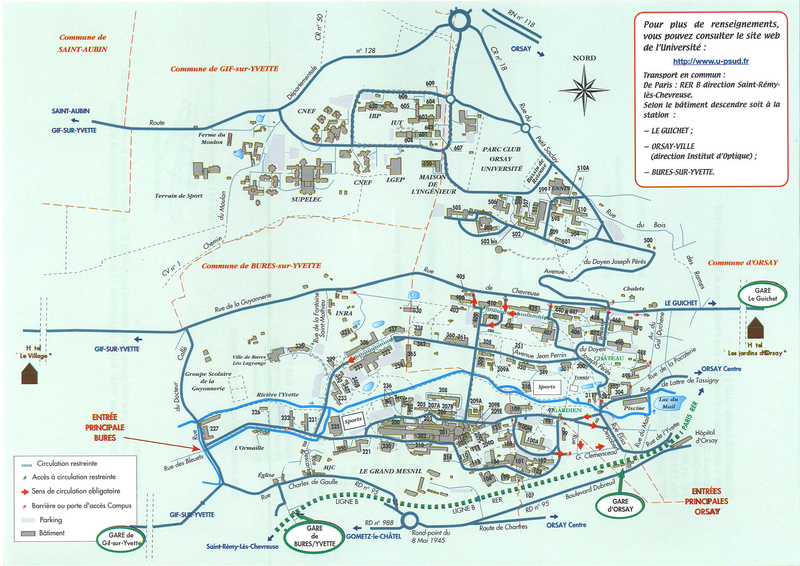 Roissy (Charles de Gaulle) airport : Take the RER B in the direction Saint-Rémy-lès-Chevreuse. Get off the RER B at the Orsay-Ville station. 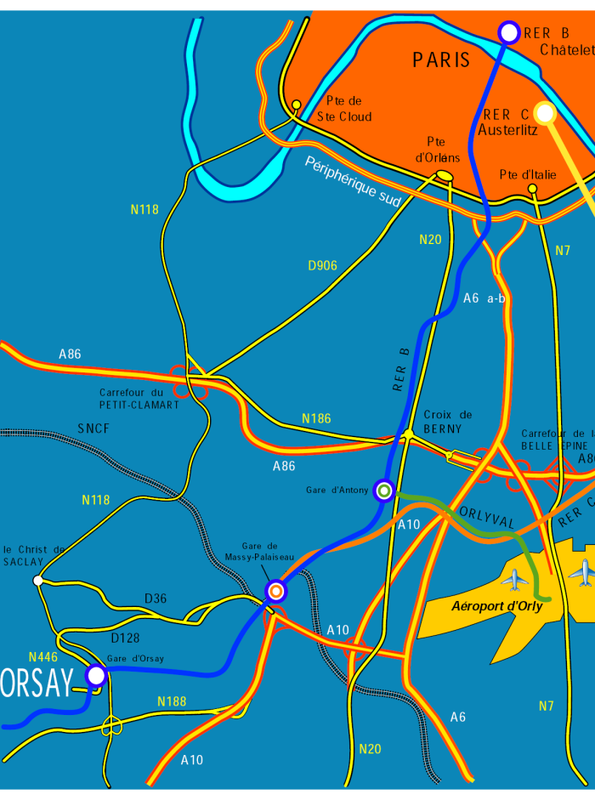 Orly airport : Take the Orlyval train to the Antony station (terminus), then the RER B in the direction of Saint-Rémy-lès-Chevreuse getting of at the Orsay-Ville station. Massy TGV train station : Take the RER B in the direction of Saint-Rémy-lès-Chevreuse getting off at the Orsay-Ville station. 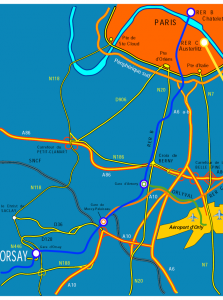 Paris by car : Take the Autoroute A6/A10 from the Porte d’Orléans or the Route Nationale N118 from the Sèvres bridge. Consult the map below to reach the laboratory. When you arrive at the Orsay-Ville station take the walkway under the tracks and then follow the directions on the map. The way from the station is only partially indicated. LPTMS is building 100 (Bât. 100).